I’ve been tinkering with the idea of tinkering. Beyond teaching literacy and math, the most important concept and skill we can teach our students is tinkering. We often think of tinkering as having small objects in front of us that we assemble, take apart and then reassemble. However, there are two ways to tinker. Physical tinkering, when we have actual objects that we manipulate, as described above, or mental tinkering, when we play around with ideas in our minds. Tinkering also takes many forms. For instance, when my daughter, a dancer, makes up dances and twirls and skips her way through our living room, she is tinkering. This tinkering may enable her to become a choreographer. Choreographers have to be willing and able to tinker. When my friend, the artist MOMO, moved away from realism and started tinkering with applied geometry and making his own painting and art making tools, he came up with new ways of creating visual imagery. He is currently in the middle of a very successful career as an artist. Tinkering led to his breakthroughs. I don’t know Stephen King personally, but I know he writes lots of stories. I would bet that he comes up with ideas for stories all of the time and tinkers with them in his mind or perhaps even on paper to see if they can lead to anything. I am currently writing my own book, The Art of Comprehension. It has taken me nearly twenty years of tinkering with an idea to turn it into something concrete. I have been writing, discarding and rewriting chapters for my book for nearly three years. Revision is a form of tinkering. I know if I wasn’t a tinkerer, I wouldn’t be writing my book. Musicians can spend their time learning to play songs that they love. The musicians who sit down and tinker with their instruments are the ones who write original music.. To create new music requires the willingness and time to tinker. Listen to anyone talk about making original music or watch any documentary documenting musicians creating music and you will see a whole lot of tinkering going on. I think of writing poems and song lyrics as tinkering with language. Trying out phrases, or rhythms, word choice and structures, all requires the willingness and time to tinker. I’ll bet Wayne Gretzky spent countless hours physically or mentally tinkering with a stick. I wonder how many hours Ronaldo and Lionel Messi have spent tinkering with a soccerball? Think Al Pacino tinkered much with the characters he played? How much time did Jim Henson tinker with puppets? Would love to see the ones that didn’t make it to the screen. Sketchbooks are a way that artists tinker. Writer’s notebooks are a way that writer’s tinker. Steve Jobs, Leonardo Da Vinci and Thomas Edison, all tinkerers. Enough said about them. All the great teachers that I know, all tinkerers. They try out different ideas all the time to see what motivates and engages their students. They ask different questions, assign different assignments, try new ideas to see what happens. Students are never the same, what engages them will often be different. Coming up with effective ways to reach each student and each class requires the ability and willingness and time to tinker. Tinkering doesn’t always produce products or ideas of value. But every idea or product that we view as valuable required someone to be willing and able to tinker. Tinkering is the path to creativity and innovation. As educators, we need to recognize when and where tinkering is happening and where it can happen. As educators, we need to see tinkering as valuable even when a valuable product or idea is not produced. 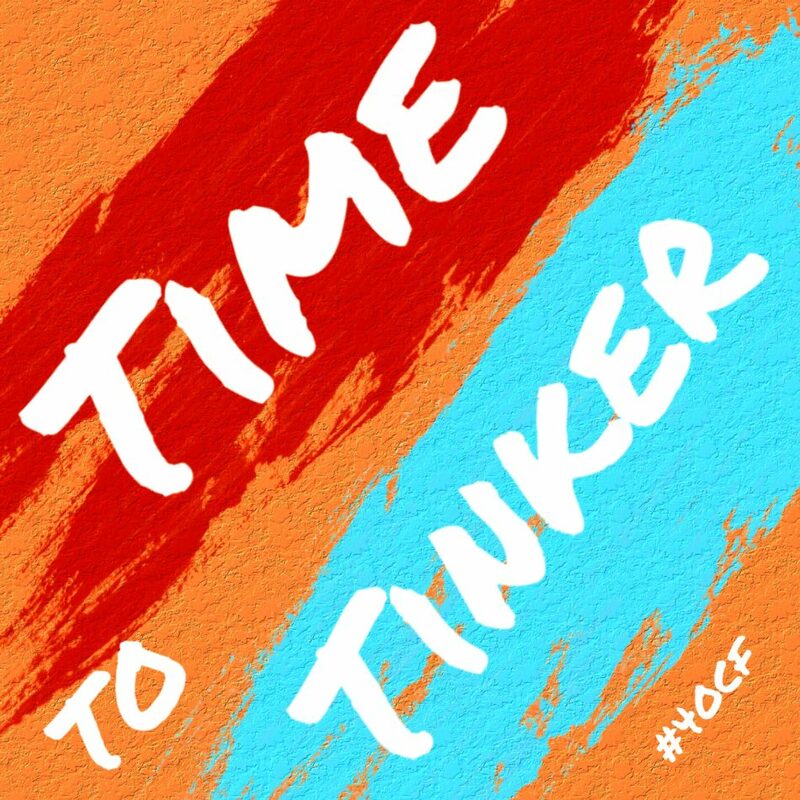 As educators, we need to give our students time to tinker. The treasure trove that is civilization as we know it, all started with the willingness, the ability and the time to tinker. If human civilization is going to continue and advance it is going to require a whole lot of tinkering.